Yes, yes, I know; it's almost impossible to tell the difference between the UK and Canada in that graph, but if you look at the original document and zoom in to 200% of the original size, you can (just barely) conclude that the UK series is the one that has the second-highest spread as of April 2008. Someone at the graphics department of the BoC deserves a scolding. The US: The spread increased by 175-200 bps since July. The Federal funds rate has decreased by 300 bps. 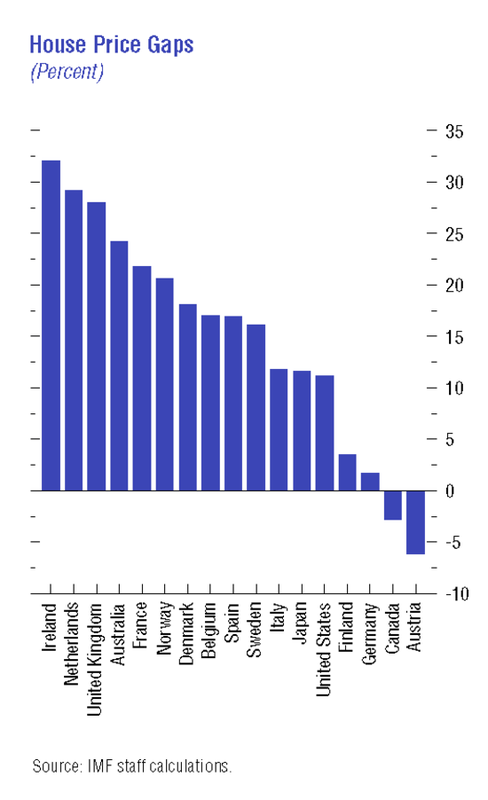 The euro zone: The spread increased by 125 bps. The ECB hasn't changed its interest rates. 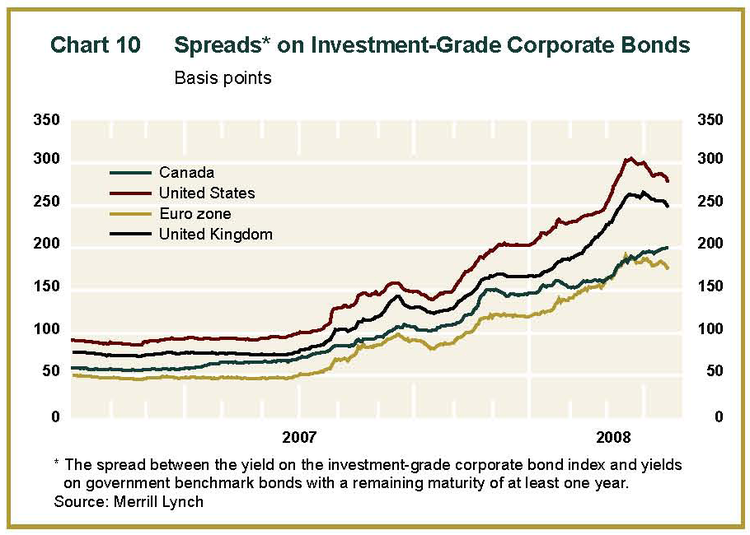 The UK: The spread increased by 175 bps. The Bank of England reduced interest rates by 75 bps. 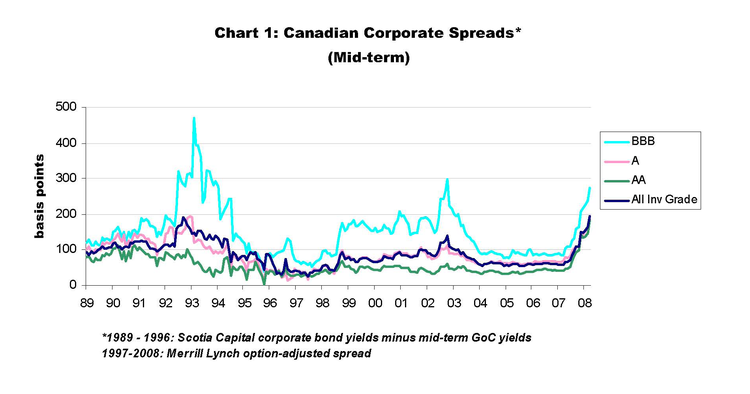 Canada: The spread increased by 125 bps. After increasing its overnight target by 25 bps on July 10, the Bank of Canada has reduced interest rates by 150 bps. Whenever I teach growth theory, I like to compare the Canadian experience with that of Argentina. Up until the 1930's, the two countries followed very similar paths: foreign investment financing the development of resource-based economies. But then the 1930's happened, and Canada and Argentina parted ways. During the 65 years between 1870 and 1935, Argentina kept pace with Canada. 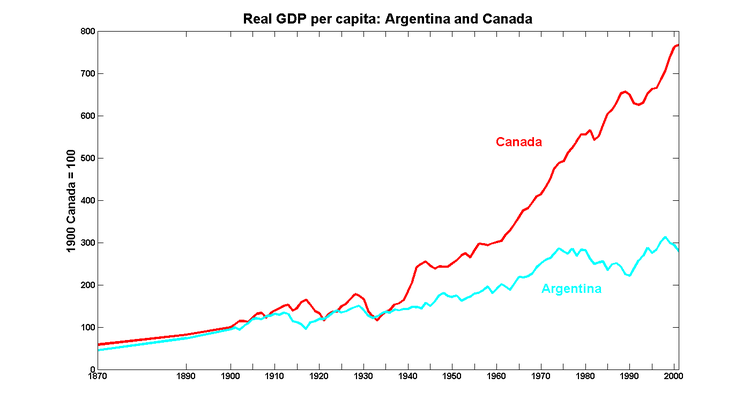 Since then, Argentina's income per capita increased by a factor of 3, less than half that of Canada. It's hard to see how that gap could be explained by anything other than the unhappy choices made by Argentina's political classes over the past four generations. Which makes me think that the answer to Dani Rodrick's question is a despairing 'yes'. Update: Brad DeLong has just reposted his 1991 piece with Barry Eichengreen on the decisions Argentina took in the 1930s and afterwards. Today's CPI release has generated certain expectations (documented here, here, and I expect in pretty much every story covering the March inflation numbers) that a 50 bps cut in the overnight rate target is in the offing next Tuesday. Those expectations may very well be fulfilled - Mark Carney has been dropping broad hints ever since he announced his presence with authority that more interest rate cuts were on the way. But it's far from clear that another dramatic cut in interest rates could be justified. In fact, there's a much stronger argument for not cutting interest rates at all. Let's deal with the inflation numbers first. Yes, y/y inflation is - by any measure - below the Bank's target. But this looks very much like a one-off level shift, not a change in the rate of inflation. What appears to have happened is that much of the long-delayed pass-through of the CAD appreciation happened all at once, and the trigger was the realisation that the CAD was trading at par with the USD. Even the most long-suffering, mathematically-challenged Canadian consumer was able to figure out that the price that she was paying was much higher than what her cousins to the south were, and a consumer revolt during the holiday shopping season led to a sudden drop in prices. And a very good thing, too. But that's not the same thing as a drop in the growth rate of the price level. For the next few months, this one-off fall in prices will continue to show up as a reduction in y/y inflation, but once it's been fully incorporated - sometime towards the end of this year - y/y inflation will jump right back up again. The housing market is doing just fine. Fixed business investment intentions are looking good. In the US, there's an awfully good case for trying to pump up the interest-rate-sensitive sectors of the economy. But Canada is not the United States; their problems are not ours, and we shouldn't be conducting monetary policy as if they were. These sectors are at or near capacity; they don't need further stimulus. I'm not at all convinced that the lesson we should draw from this graph is that Canada is facing a credit crunch, and that the remedy is an expansionary monetary policy. These spreads have not shown up in the real economy (mortgage rates are lower than what they were before the subprime crisis hit), so the only thing I see is hard times for those who happen to work in the financial sector and whose livelihoods are directly affected by these spreads. It's probably not a coincidence that in the last two meetings of the CD Howe Monetary Policy Council, the private sector members' recommendations have been lower that those made by the academics. Or that bankers are anxious to put forward the notion that a 50 bps cut on Tuesday is somehow a slam-dunk. I will not be overly distressed by a 25 bps cut. But if the Bank of Canada lowers its target for the overnight rate by 50 bps on Tuesday, it will be time to start talking about a 'Carney put'. And it will also be time for someone to make it clear to the Governor of the Bank of Canada that the instincts learned at an investment bank will not serve him well in his new job. High taxes doesn't mean big government. And low taxes doesn't mean small government. It is possible to imagine an economy with high taxes that are used to redistribute income with only a minimal distortion of markets. It is possible to imagine an economy with low taxes that are used to pay the salaries of a small number (it wouldn't take very many) of functionaries whose job it is to distort markets as much as is humanly possible. 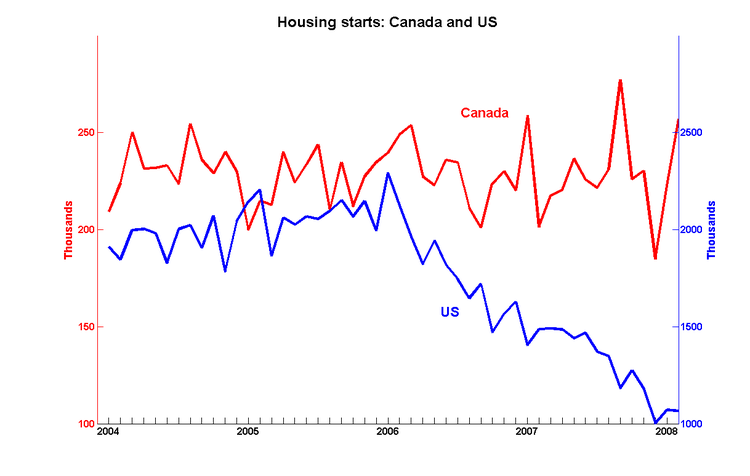 Although housing starts in the US are about half of what they were two years ago, they are more or less holding up in Canada. And new house prices are still rising. The housing sector has been an important source of growth over the past few years in Canada and elsewhere. But the difference is that housing market activity in Canada doesn't appear to have been built on a bubble, so there's reason to hope that this sector will continue to perform well. This is yet another reason why the Bank of Canada should be cautious in how it manages interest rates: five-year mortgage rates are now back down to what they were before the subprime crisis hit. There's not much slack on the supply side of the housing market, so the only effect of an aggressive reduction in interest rates will be to drive up prices - and perhaps start the sort of bubble market that we've been able to avoid until now.